On-demand provisioning is intended to accelerate app development by eliminating the need for development teams to request and wait for operators to create a service instance. However, to control costs, operations teams and administrators must ensure responsible use of resources. Each Pivotal Cloud Foundry (PCF) service has a separate service broker. A global quota at the service level sets the maximum number of service instances that can be created by a given service broker. If a service has more than one plan, then the number of service instances for all plans combined cannot exceed the global quota for the service. The operator sets a global quota for each PCF service independently. 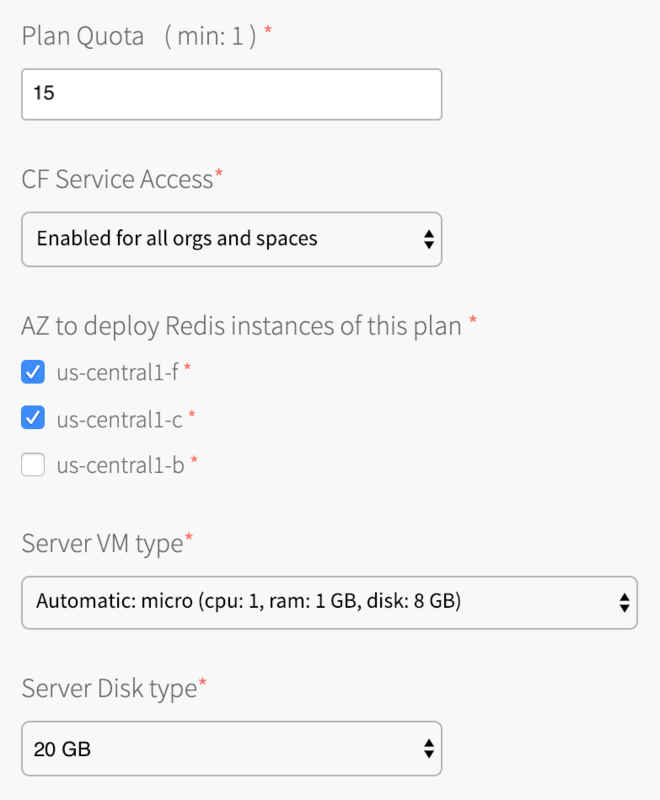 For example, if you have Redis for PCF and RabbitMQ for PCF, you must set a separate global service quota for each of them. When the global quota is reached for a service, no more instances of that service can be created unless the quota is increased, or some instances of that service are deleted. A service may offer one or more plans. You can set a separate quota per plan so that instances of that plan cannot exceed the plan quota. For a service with multiple plans, the total number of instances created for all plans combined cannot exceed the global quota for the service. When the plan quota is reached, no more instances of that plan can be created unless the plan quota is increased or some instances of that plan are deleted. An org-level quota applies to all PCF services and sets the maximum number of service instances an organization can create within PCF. For example, if you set your org-level quota to 100, developers can create up to 100 service instances in that org using any combination of PCF services. When this quota is met, no more service instances of any kind can be created in the org unless the quota is increased or some service instances are deleted. For more information on managing org-level quotas, see Creating and Modifying Quota Plans. A space-level service quota applies to all PCF services and sets the maximum number of service instances that can be created within a given space in PCF. For example, if you set your space-level quota to 100, developers can create up to 100 service instances in that space using any combination of PCF services. When this quota is met, no more service instances of any kind can be created in the space unless the quota is updated or some service instances are deleted. For more information on managing space-level quotas, see Creating and Modifying Quota Plans. To view org quotas, run the following command. For more information on managing org and space-level quotas, see the Creating and Modifying Quota Plans. On-demand plans use dedicated VMs, disks, and various other resources from an IaaS, such as AWS. To calculate maximum resource cost for plans individually or combined, you multiply the quota by the cost of the resources selected in the plan configuration(s). The specific costs depend on your IaaS. The image below shows an example that includes the VM type and persistent disk selected for the server VMs, as well as the quota for this plan. Important: Although operators can limit on-demand instances with plan quotas and a global quota, as described in the above topics, IaaS resource usage still varies based on the number of on-demand instances provisioned. To calculate the maximum cost for all plans combined, add together the maximum costs for each plan. This assumes that the sum of your individual plan quotas is less than the global quota. Find the number of instances currently provisioned for each active plan by looking at the total_instance metric for that plan. Multiply the total_instance count for each plan by that plan’s resource costs. Record the costs for each plan. Add up the costs noted in Step 2 to get your total current resource costs.